NEW ORLEANS – Region foes in NCAA Division III Cross Country squared off across the nation this past weekend as the postseason nears. That meant a lot of changes to the most recent Regional Rankings released Tuesday by the U.S. Track & Field and Cross Country Coaches Association (USTFCCCA). 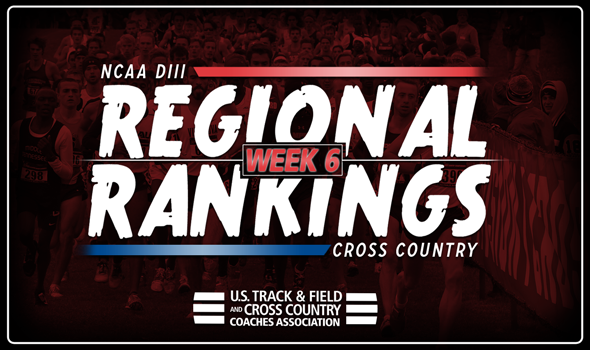 For those who don’t know or need a refresher, the USTFCCCA Regional Rankings are determined subjectively by a single member coach in each of the eight respective regions. The regional representative is tasked with weighing returning teams’ strength with current season results (if applicable) in determining team finishing order at the upcoming NCAA Division III Regional Cross Country Championships. This year the NCAA Regional Championships will be held on Saturday, November 11. Men: SUNY Geneseo and RPI remain No. 1 and No. 2 after strong efforts by both squads. The Knights finished runner-up at the Pre-National Invitational, while the Engineers won the Connecticut College Invitational. St. Lawrence is still No. 3 after an idle week and is followed by No. 4 NYU and No. 5 Rowan. Women: SUNY Geneseo is still No. 1 following a third-place finish at the Pre-National Invitational. The Knights are followed by new No. 2 TCNJ and new No. 3 RPI. St. Lawrence remains at No. 4, while Ithaca comes in at No. 5. Men: Loras and Wartburg are still in prime position to earn automatic bids to NCAAs according to the pollster. St. Olaf jumped to No. 3 as Nebraska Wesleyan fell to No. 4. Carleton made a big jump in the index as it vaulted four spots from No. 9 to No. 5. Women: Carleton and St. Olaf remain No. 1 and No. 2 after cementing those spots this past weekend. Nebraska Wesleyan moves up to No. 3 and St. Thomas (Minn.) is now at No. 4 after No. 5 Warburg tumbled two spots from No. 3 to No. 5. Men: Calvin and Ohio Northern are still No. 1 and No. 2, while Depauw jumped seven spots from No. 10 to No. 3. The Tigers ran at full strength for the first time this season and dazzled at the Oberlin Inter-Regional Rumble. Otterbein and John Carroll come in at No. 4 and No. 5 as the latter climbed four spots from No. 9. Women: Nothing remained the same from Week 4. Otterbein is the new No. 1 after winning the Inter-Regional Border Battle. Former No. 1 Hope fell to No. 2 and former No. 2 Calvin tumbled to No. 5. Former No. 5 Oberlin won the Inter-Regional Rumble and is No. 3 and Case Western Reserve fared well at the Yellowjacket Invitational and is now No. 4. Men: Haverford and Carnegie Mellon are No. 1 and No. 2 once again after finishing 1-2 at the Inter-Regional Border Battle. Johns Hopkins held steady at No. 3, while York (Pa.) jumped from No. 6 to No. 4 and Dickinson fell from No. 4 to No. 5. Women: Johns Hopkins won’t be going anywhere atop the rankings, nor does it seem like Dickinson will be leaving its side at No. 2. The rest of the top-5 is identical once again as Elizabethtown, Haverford and Carnegie Mellon round out that group. Men: Nothing changed in the top-5 as No. 1 North Central (Ill.), No. 2 UW-La Crosse, No. 3 Washington (Mo. ), No. 4 UW-Eau Claire and No. 5 UW-Stout all handled business as expected at meets this past weekend. Women: Wheaton (Ill.) is the new No. 1 after beating the top-4 teams from last week’s index at the Pre-National Invitational. Former No. 1 Washington (Mo.) dropped to No. 2 after a fifth-place finish in Elsah, Illinois, while UW-La Crosse comes in at No. 4. Chicago and UW-Eau Claire finished right next to each other at Pre-Nationals in eighth and ninth and are ranked No. 4 and No. 5 this week. Men: Amherst is still No. 1 after beating No. 3 Williams at the Little 3 Championships. MIT holds steady at No. 2 following a sixth-place finish at the Pre-National Invitational. Middlebury remains No. 4, while Connecticut College moved up to No. 5 from No. 8. Women: Nothing changed in the top-5 here as MIT, Williams, Middlebury, Bates and Tufts are all in order once again. There could be some movement in the national poll when it comes to the Engineers as they proved to be a game runner-up to Johns Hopkins at the Pre-National Invitational. Men: Nothing changed in the top-5 here as No. 1 Christopher Newport, No. 2 Rhodes, No. 3 Emory, No. 4 Washington and Lee and No. 5 Trinity (Texas) all remain in place. Women: Trinity (Texas) moved up to No. 1 following a strong effort at the Pre-National Invitational. Emory is No. 2, while Lynchburg jumped from No. 4 to No. 3. Centre fell from No. 3 to No. 4 and Rhodes comes in at No. 5. Men: There weren’t any changes to the top-3 teams as No. 1 Pomona-Pitzer, No. 2 Occidental and No. 3 Claremont-Mudd-Scripps hold it down once again. UC-Santa Cruz jumped from No. 7 to No. 4 after winning the Santa Clara Invitational and Lewis & Clark is No. 5 after a third-place effort at its own invitational. Women: Claremont-Mudd-Scripps, Whitworth, Linfield and Occidental are No. 1, No. 2, No. 3 and No. 4, respectively. Colorado College vaulted from unranked to No. 5 this week thanks to a strong effort at the Lewis & Clark Invitational and a 27-second spread.